Ever since its reveal on October 6, the Surface Book has become one of the most coveted pieces of premium tech around, with stocks running out days after announcement and pre-orders coming faster than Microsoft can produce the machines. Unfortunately, high demands also means more pressure on the distribution and high potential for disappointment, resulting in some really angry customers; in this case, ex-Microsoftie and current Director of Product at Amazon for Alexa and Echo, Charlie Kindel. 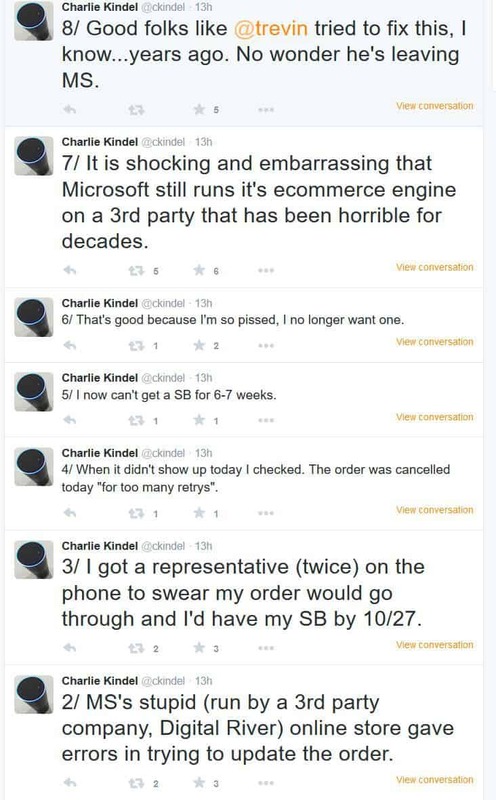 In an 8-tweet rant series on Twitter from yesterday, Kindel expressed his frustration with pre-ordering the Surface Book through the Microsoft Online Store. Apparently pre-ordered on the announcement date October 6, Kindel waited eagerly for the machine, only to get a notice of declined cc last week. A bank confirmation and two exchanges with a sales representative resulted in a promised date of October 27, which, unfortunately, did not materialize, with Kindel’s order being cancelled just today for “too many retries.” Kindel is apparently so livid he got off the idea of getting a Surface Book altogether, and went to Twitter to vent his frustration, through which he also noted the upcoming departure of Microsoft’s current Director of Product for Microsoft Store, Trevin Chow. The first tweet was then followed by a rant, ending with the Trevor Chow tidbit. All the animosity seems to be put on Microsoft’s third-party partner for e-commerce, Digital River, and how they have been “horrible for decades.” Others have shared his frustration and problems on Twitter. A long-time Microsoft employee, Charlie Kindel was the father of Windows Home Server and general manager for Windows Phone. He left the company a few years ago to join the startup world (not without declaring Windows Phone the “best product Microsoft has ever built,” so positive karma), before being hired by Amazon for its Alexa and Echo project. It’s unfortunate, and somewhat ironic, that he is now having problems with obtaining another of Microsoft’s “ultimate” product, arguably much more positively received than Windows Phone. With mass distribution of a product, problems are bound to occur, even more so for a new, presumably low-stock luxury item like the Surface Book, as Microsoft has been very careful with production ever since the Surface RT writedown; hopefully it should only affect a small minority. In the meantime, we can only hope that Kindel will change his mind after cooling down, and just go to get a Surface Book at the nearest Microsoft Store; it is, after all, a pretty awesome piece of hardware. Are you having problems with Surface Book orders? Share your experience below.